The United States of America’s first special operations forces were the Marine Raiders of World War Two. Today’s Raiders carry on their name and legacy, as they are continually deployed throughout remote areas of the world, answering our Nations’ call and keeping America forward. The Marine Raider Foundation is proud to honor these quiet professionals who are responsible for effecting positive change for future generations and preventing conflicts from arriving on our shores by funding memorials and events dedicated to their service. Legacy Projects that enhance the connection between WWII and MARSOC Raiders. As if it were not enough that the Marine Raider Foundation was there from the beginning of our grieving, they are still with us today. In the three-and-a-half years that we’ve known the fine people at the Marine Raider Foundation, they have included us in their annual Resiliency and Remembrance Weekends, supported a memorial for my son on the MARSOC Compound known as ‘USMC Cpl. 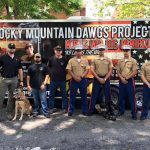 David M. Sonka Kennels’, allowed us to join them at the annual Marine Corps Marathon, and most importantly, stayed in touch with us, making us feel like a part of their family. For these things, we are forever indebted. People should get involved with the Marine Raider Foundation because they are the ones helping not only Gold Star Families cope with their losses, but they also help MARSOC personnel, whether it be at home or abroad. All anyone has to do is call out for help and they are the first ones to respond - no questions asked. They are not about themselves; instead, they put the mission first. The Marine Raider Foundation was our backbone in our hardest and most trying time as a family, and still is today. Since the passing of our son, the Marine Raider Foundation is still here with us and we continue to grow closer to them. We have become a part of something bigger than us and couldn’t be any more proud to be associated with the Marine Raider Foundation.